When is a German Shepherd physically/mentally mature? I'm not sure if the title is the best way to phrase my question. If this post turned out to be a rant, I apologize in advance. 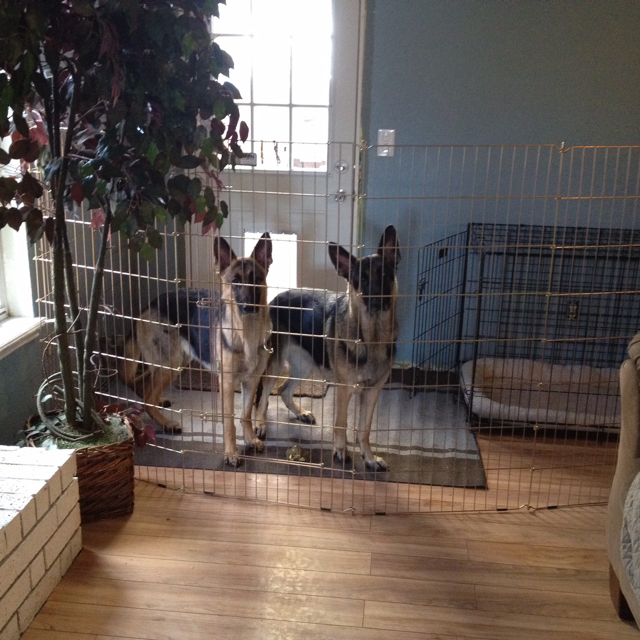 We have a one-year-old German Shepherd, who's of course a little troublemaker at this age. We're told that we need to exercise him and give him mental challenges, or else he gets bored and becomes destructive. I take him to the dog park every weekend (Friday, Saturday, Sunday) to socialize. I play fetch with him each morning before work, making sure that he's exercised to the point that he'll walk to the ball and flop down to rest because he's had enough running. I leave him with a kongball full of treats and other toys while I'm at work. I take him to doggy daycare two days a week. He's currently seeing a trainer every week, so after work I practice with him the new skills that we learn from the trainer. With all of that, I still feel like he's not exercised enough. There are still days that I come home to find a corner wall being chewed up or papers being shredded, and mornings that I wake up to his bed being torn into pieces. My husband has been abroad since September and won't be home until the summer, hence I'm the only one taking care of him. It has been a lot of work and a lot of stress on me, and every time I raise my concern to people on the internet, I get a "you should rehome your dog if you can't give him your time and attention." We've been pretty depressed ever since my husband left, and we need each other's company. I keep hanging on and telling myself that once my husband is back, everything will be better, because all of our lives were so much better when he was here. Anyway, will there be a point that my dog will be perfectly content being home by himself? I won't have to spend hours running him and giving him my undivided attention when I'm home. I can walk him in the morning and play fetch with him after work, and I won't see any signs of destruction from him. I won't have to take him to daycare (or maybe once a week instead of twice a week), and he'll be happy with the toys at home while I'm away. Will there ever be such a point? I'm only asking because my husband and I are planning to have a baby in the near future. We don't want a baby too soon that we'll have to eventually rehome our dog because we can't make time for both the dog and the baby. We also don't want to wait too long, because we want to maximize the time our baby have to grow up with our dog. Is there a sweet age in dog that having a baby would be okay? An age where he'll get along with the baby and won't be sad if we have to devote our time with the baby and not with him 24/7? Of course we won't neglect him, we'll take him on strolls and to the dog park with the baby, and we'll play fetch with him while baby's enjoying the fresh air. But we want him to be okay if we spend time holding our baby or changing diapers instead of petting him. GSDs are high energy dogs that do need a lot of attention and exercise. I would not leave him loose in the house if he can't be trusted while you are gone. I still crate some of my dogs when I am gone. My rescue GSDs did seem pretty settled at 4-5 years old. My current youngsters, age 1 and age 3 are still very energetic and need lots of play time. You have tons going on and there is no quick and easy answer. I had Sabi who was born mature and well behaved, Lex who was a proper little lady by 8 months, Bud who did not have any discernable brain function until he was nearly 5, Shadow who is a good dog that makes poor choices still at 8 and everything in between. I have had dogs that adored children, dogs that tolerated them and dogs that really would have preferred not. You said your husband is deployed so I would definitely wait until your dog is at least mature and trained. But you need to crate train this dog, it should have happened already. dogfaeries, clipke and kaydub_u like this. It could be the contrast between daycare(stimulating) and being home alone calmly is a difficult transition.I would crate or kennel him to keep him from wandering around looking for stimulous.IME they are mentally/physically mature by age 3.
dogfaeries and Sabis mom like this. Yep, a crate to keep the dog and your stuff safe. I made a mistake and let Russ have too much freedom one time. He chewed the upholstery on a chair, ended up at the vets with exploratory surgery and lost 3” of intestines. Sometimes they’ll fool you and not tear anything up for a long time, then go on a destructive binge. Like Sabis mom’s dog, Carly was born serious and well behaved. She’s always been great with children, and loves them. Her vet suggested when she was quite young, that she would be a great dog for that program at the library where the kids read to dogs. Scarlet, on the other hand, will be 3 in August, and she’s still a feisty little beast. I think she’s too wound up for toddlers, but good with older kids. It’s just going to depend on your individual dog. We do have a crate but he has outgrown it. I'm gone for 9 hours during work, so I feel really bad leaving him in the crate (even those puppy eyes he gives me when I leave in the morning make me sad). I don't know how to keep him entertained in a small space for 9 hours. How would he go potty? I just want him to be able to roam around and work his muscles instead of being jailed for 9 hours. Yes, I know I probably have the wrong idea of crate training. I'm afraid he'd bark or whimper out of frustration. We had an anonymous complaint from the neighbors before about his barking (even though I can guarantee he only barks a few times at the mailman or at other dogs walking by, not "ALL DAY" like the neighbors claimed). They threatened to call animal control, so I got really scared and open the doggy door so he can stay inside the house or outside in the backyard. I spray vinegar/water at the house corners and take away things that he could chew up. Most of the times he'd be fine. A few times I'd come home and he had found something to destroy. Every time I posted a question online to help with his puppy behavior, I got either "you need to exercise him more" or "you need to rehome him if you don't have the time for him." I don't know what I'm doing wrong. How much exercise is enough and how much time is enough? I just started him in doggy daycare last week, because my husband and I decided that he needed the socialization, and I needed a mental break from coming home to him making a mess somewhere. How do I make the transition between daycare and home-alone better? p.s: I'm a first-time dog owner so I'm very inexperienced. Please be patient with my questions. Thank you! I also have a dog door. So just a suggestion. If you want him to be able to go out the dog door when you’re gone, then can you put something in the inside of the house to contain him? Large crate? Securely covered expen? I did this one time when we were having a lot of rain, and mud issues. I didn’t want them making my living room a swamp. crittersitter, Sabis mom, CometDog and 2 others like this. You picked a very challenging breed for a first time dog owner. :-) If he's outgrown the crate, you get a bigger crate and/or set up a nice enclosed area he can't destroy/escape as shown in the last post. Any damage incurred is your fault, not his, if he's not contained. It's a bit of tough love I'm afraid. Remember, you're in charge - not him. You do have your work cut out for you but I admire your commitment. Good luck! clipke and kaydub_u like this. I bought a very large crate from amazon for less than $75 shipped, think it’s the 48” model from amazon basics. My pup is 25” at least 70 lbs and he has plenty of room.